The Orissa state government is all geared up for launching a bunch of new schemes in the state. To provide a healthy and better life to the underprivileged people in the state, the CM Naveen Patnaik has announced about four health care schemes recently in a an event. Ama Clinic Scheme and Anmol Schemes are two of those four schemes which will start implementing soon across the state. The schemes will be launched officially from 1st Jan 2018. Chief Minister Naveen patnaik has announced about the scheme in the middle of the month December 2017. 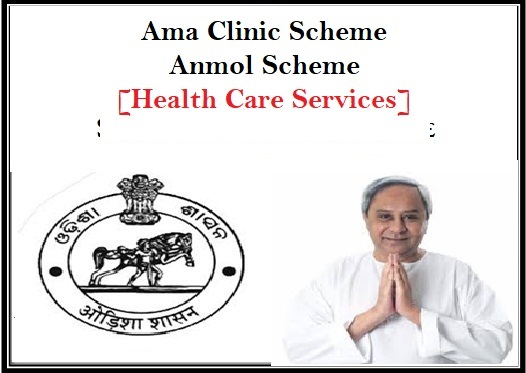 Scheme details: Ama Clinic Yojana is one of the four health care schemes. Under this scheme there will be clinics where special consultants and specialist doctors will be available. Patients can fix same day appointment in case of emergency. Specialists/Services: There will be specialists for medicine, physiologists, eye care, psychiatrists, paediatrician, gynaecologist, obstetrics and Geriatrics available for the consultation. Beneficiaries: Around 45 Lac people in the urban area will get benefitted from the scheme. People who are living below the poverty line will get the advantages of the schemes. Objective of the scheme: The most important objective of this scheme is to reduce the mortality rates of infants and mothers. To lowering down the infant mortality and maternal mortality, this scheme has been announced. Objective of the Scheme: Under Anmol Scheme, tablet computers will be provided to the Auxiliary Nurse Midwives. These computers will have updated technology that will help them to work faster and smoother. Benefits: With Anmol tablet computer, ANMs will be able to work faster. Also with latest technology, they will be able to take quick remedial actions for the patients in emergence. Working process: These computers will be helpful to work on patients’ details as well as monitor and provide all the necessary services in health care sector to the needy people on time. Better treatment: The tablets can be used in providing better treatment than before. Patients like infants or new born babies, their mothers and pregnant women will get benefitted from this scheme. Apart from these two Nidaan and Sahay are the two main schemes that have announced by CM as well. Under Nidaan scheme needy people will get free diagnosis service from the state government and NHM for their treatment. Path-lab facilities such as X-ray, CT scan, MRI and ultra sounds will be done without any cost. Another scheme is Sahay scheme. Under this scheme patients who are suffering from Kidney diseases will get free dialysis services. Those who are living below the poverty line and need dialysis on regular interval will get benefits from this scheme. There will be 127 dialysis machines installed in 25 primary health care centres and district headquarters hospitals across the state. These schemes will be launched to provide healthier and better life to the people who are needy. Nearly Rs. 600 Cr has been allocated for two of these schemes for 5 years. By March 2018, all the necessary works will be done and the schemes will expected to start operating after that.